On Thursday the pair USD/СAD was under the influence of controversialeconomic factors. 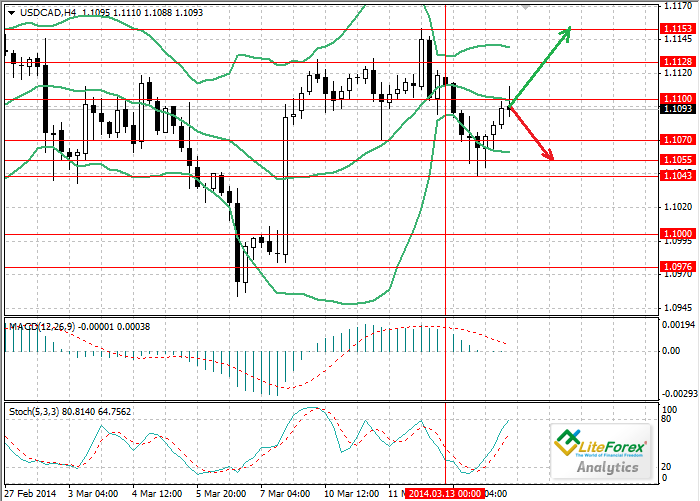 In the morning the USD weakened due to negative Chinese statistics for February. It became known that volume of industrial output and retails sales in China amounted to 8.6% and 11.8% respectively, which was the worst performance for the period of crisis. Following publication of this data the price of the pair reached the lows of 1.1043. However, later the price started to grow due to support of strong American statistics. Therefore, by the end of the day the pair regained almost all losses. The release of important news, which can affect price movement, is not expected today; however at the beginning of next week, following announcement of result of referendum in Crimea, market volatility can increase. At the moment USD/СAD is trading at the level of 1.1100, which coincides with the middle moving average of Bollinger bands indicator and seems the key one. Breakdown of this level will enable the rise up to 1.1128 and 1.1153. In case of opposite situation the pair may roll back to 1.1070 and 1.1055. Probability of ascending movement is also confirmed by Stochastic. Its lines are directed upwards and are ready to move to overbought zone. MACD histogram is in the zero line, not giving any clear signals. In the current situation it makes sense to place long positions with the target of 1.1153 if the price consolidates above the level of 1.1100. Short positions with profit taking at 1.1055 can be opened if the price falls to the level of 1.1085.